The scandal over the agency’s work has become the most serious conflict in U.S.-Russia relations since Vladimir Putin’s inauguration. The United States announced on Sept. 18 that its Agency for International Development (USAID) would wrap up its operations in Russia. USAID is the largest sponsor of Russian NGOs, providing more than $100 million in funding annually. Washington has blamed the Russian government for the move, although the Kremlin has made no specific decision on ousting USAID, according to Russian presidential spokesman Dmitry Peskov. He later said that Russian President Vladimir Putin admitted that USAID was trying to influence the country’s politics to a certain extent. Department of State spokeswoman Victoria Nuland made the announcement about USAID winding down its operations in Russia. “We have recently learned of the decision of the Russian Government to end USAID activities in the country. The United States is extremely proud of what USAID has accomplished in Russia over the last 20 years, and we will work with our partners and staff to responsibly end or transition those programs,” Nuland said. According to Nuland, Russian authorities forced the United States to shut down USAID work in Russia; the Kremlin has denied this. “Like all foreign agencies that finance Russian NGOs, USAID has to comply with Russian legal norms. It stands to reason that, as long as the Americans comply with these regulations, we cannot make any decision to end their activities in our territory,” Peskov said. On issues of democracy and human rights in Russia, this USAID walkout has caused the biggest rift between Moscow and the West in the past five years. The last time a government entity of a comparable level left Russia was in 2007 — the British Council shut its doors in the country, after Russian authorities accused it of evading taxes and breaching Russian law. The United States Agency for International Development (USAID) was established on November 3, 1961, under John F. Kennedy’s administration. A federal agency, it operates subject to the guidance of and in coordination with the U.S. Department of State. USAID has 87 missions worldwide. Two-thirds of its 8,500 employees work in overseas offices. The agency has been present in Russia since 1992. Deputies from Russia’s ruling party United Russia and pro-Kremlin youth movement activists have repeatedly criticized USAID activities in Russia. Attacks on the agency intensified after last December’s State Duma elections and the subsequent opposition rallies. 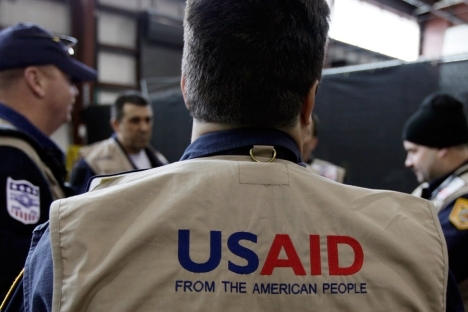 USAID has been accused of distributing grants to many human rights organizations, as well as to the Golos election-monitoring group. According to the American government website foreignassistance.gov, USAID and the State Department have spent $861.8 million on projects in Russia since 2006. In 2011, the agency spent $127.6 million in Russia, including $70 million on “promoting democracy and human rights.” Overall, however, Russia is a peripheral area for USAID. In 2012, for instance, the country will still rank only 40th in terms of allocated funding. In July 2012, the Russian State Duma passed a new law on foreign-agent NGOs, largely to restrict the activities of entities in the country that existed on USAID grants. Under the law, NGOs receiving “money or property from foreign states, international or foreign organizations, foreign citizens or stateless persons” while engaging in “political activity” are to be given the status of a foreign agent. Russia’s Foreign Ministry accused USAID of attempts to influence elections on Sept. 19: “This decision was primarily led by the fact that the nature of the work done by the Agency’s representatives in our country was not always in line with its stated goal of promoting the development of bilateral humanitarian cooperation. This means attempts to exert influence through the distribution of grants for political processes — including elections at various levels — and institutions of civil society,” the Ministry reported. The law requires that “foreign agents” apply to the Ministry of Justice to be placed on a special NGO register. Organizations in this category must also note their foreign agent status in every media or web-based publication they produce. A refusal to supply this information is subject to up to 1 million rubles ($32,000) in fines, while NGO managers responsible for repeated violations are liable to face up to three years in prison. Sources close to the U.S. Government have noted that there was a direct link between the passing of the NGO law and the shutdown of USAID operations in Russia. First published in Russian in Kommersant Daily. Aleksandr Gabuev, Ilya Barabanov, Yelena Chernenko contributed to the article.